This is quite a large Turquoise "Donut" that is mostly the matrix and lovely splotches of the green, blue and yellow. 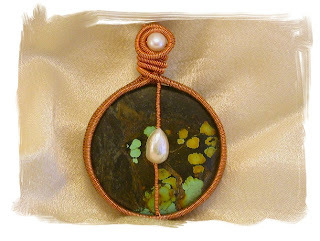 Wrapped in a fine copper wire (24 gauge) woven bezel with lovely freshwater pearl accents at the top and over the hole in the middle. A large bail that can accomadate a large multi strand of beads or pearls. This fantastic style of wire woven bezel setting was the brainchild of a Wonderful Wire worker, wrapper, Dancing Feather (who I am in utter awe of ) Her instructions for this technique was published in Step by Step wire Jewelry the summer preview edition... And a sweet sweet Lady to boot! 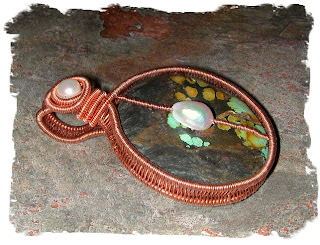 I love this technique and have had great success in using it for many pieces that would have been difficult to set in traditional pronged wire wrap or wire sculpted settings.